Join the discussion on our forums! Come discuss Haunting Vision over in our dedicated Haunting Vision discussion topic. "You see son, when a Preparation and a Primordial Glyph love each other very much..."
Primordial Glyph with the mana reduction not forced to be attached to the discovered spell, but you have to use the reduction that same turn. Definitely weaker... Shaman spell list isn't as great as Mage either. First it costs 1 more and along with that: In standard, (so far,without the new exp), shaman has 20 spells of 2 or less mana (most of them less), and 12 of 3 or more mana. so either you take something that costs less (doesnt always have to be a lightening bolt that might excuse the bad mana-efficiency), but maybe you get totemic might, primal talisman and if you're lucky (manawise) maybe eureka. I dont really think it will see play on long term...at least until next rotation. Can we take a moment to appreciate the awesome art of this card? Why would I want to use this over any other card? 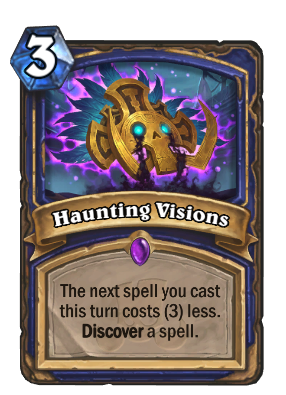 This is effectively a 0-cost 'discover a spell' card, which is not worth replacing a card in your deck. I don't even know where to begin. Primordial Glyph - best Mage card in history other than pre-nerf Mana Wyrm. Sure, you have to use it the same turn for the mana reduction, but that's not a big drawback because you still keep the discovered card. You've seen Primordial Glyph right? This isn't Primordial Glyph though, keeping the mana reduction is a huge reason why glyph is so strong. Wouldn't it be great if you Discover Far Sight, then draw another one, then do it again? Those visions would be haunting for your opponent I guess. Does this reduce the cost of your next spell by 6 if comboed with Electra Stormsurge ? b) to look for an out by discovering a spell, Healing Rain, Volcano or Hex... what ever I need at the time. Both times it works as 0-mana discover, the only downside is that I may get bad spell but it seems still good. After all shaman has good spells and I would play 3rd copy of Volcano in my deck if I could, this card gives me a chance. Well on early turns you play it when you have some other spell you want to play and just get another spell for free. In kate game you are guaranteed to be able to play any spell you discover but would you want to. So still play right before Hex or Volcano or something, can let you triple up on some removal or discover some spell which is usually bad, but useful in current match.